We had an astonishingly lovely spring morning for the latest work day. This time we focused on sorting out the ‘try-out’ beds on Plot 1B. The idea is that these 4 try-out plots – about 6M x 1M – will be offered for rental for one year to people who are on the plot waiting list, but not at the top (so unlikely to get a plot in this calendar year). 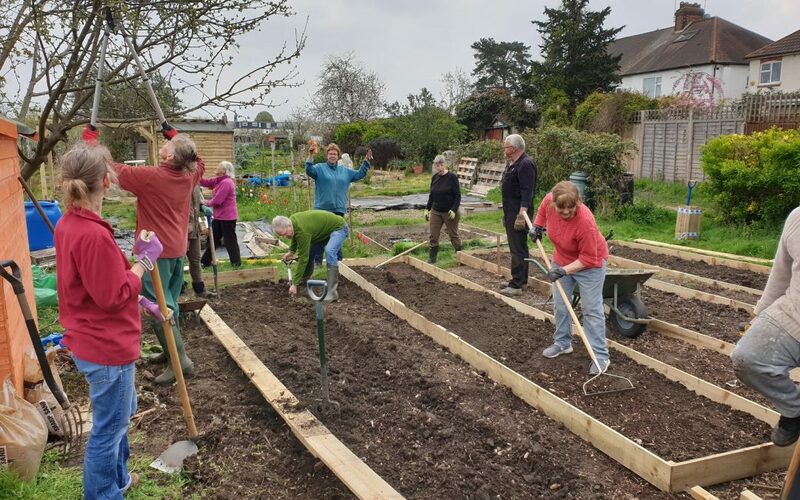 They will get a chance to try a mini-allotment, join in the allotment community and see if it’s for them – before they take on the commitment of a larger plot. Over the morning, there were over 20 volunteers helping out; it really was a case of ‘many hands make light work’ with some wonderful teamwork! : clearing/levelling the very grassy ground, setting out the 4 beds, constructing the wooden edges to define them, laying wood chip paths around the edges, as well as pruning the apple tree which overhangs the plot. Between us a great deal was achieved, so here’s the proud ‘AFTER’ photo for the records! 5 men and 11 women …………..